We are giving away a pair of tickets to Hillstomp @ Aladdin Theater on April 19. To win, comment on this post why you’d like to attend. Winner will be drawn and emailed Monday, April 15. If you’ve spent any amount of time around the Northwest Music Scene, the name Hillstomp should sound familiar to you. They’ve been making music for the past 17 years and touring across America and Europe. And yet misconceptions still abound. Let’s start this one… “They’re a Blues Band”. Well, sure, they know how to drive the blues as well as anybody, and credit RL Burnside among their influences, but lots of their songs are played on a banjo and just as suggestive of Appalachia as they are of Mississippi. “They’re a Jam Band”. Fine, it’s impossible not to dance when Hillstomp is in top gear, and there are more than a few barefoot hippies at every show, but they’re offset by the punks and the hillbillies, so I consider that a wash. Plus the songs are almost all 3 minutes or less, leaving no time for guitar noodling. 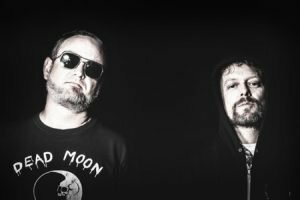 Hillstomp is a 2-man band comprised of Henry Hill Kammerer and John Johnson. Henry plays guitar and banjo like a hurricane, and if you close your eyes you’d swear he’s playing 2 parts at once. John Johnson beats mercilessly on his drum kit (which often contains a bucket, brake drum and broiler pan) with the fury of a demon loose from hell. But once you get past the pure ferocity of his playing, you notice that the parts are intricately crafted patterns that provide the framework for Kammerer’s guitar and banjo sorcery. This is folk music in its purest form – from loud and gritty, to intricate and poignant, and most importantly, always heartfelt and true. I first saw hillstomp shes ago at pdx pop now. I’d love to see them rock the aladdin! I tried to see Hillstomp in Walla Walla where I live. I didn’t see the event announcement until the show had already started, but hurried to the venue anyway, paid the admission and caught just the last 1/2&1 song. SUPER SUPER DISAPPOINTED!!!!!!!!! (Suffered through the 2nd band because the admission was redic!) Although I’ve seen Hillstomp several times, I’d love to see this show! Kinda make up for my Great Walla Walla Disappointment of February 8, 2019. Just looked them up on Youtube and now I really want to go see them play!